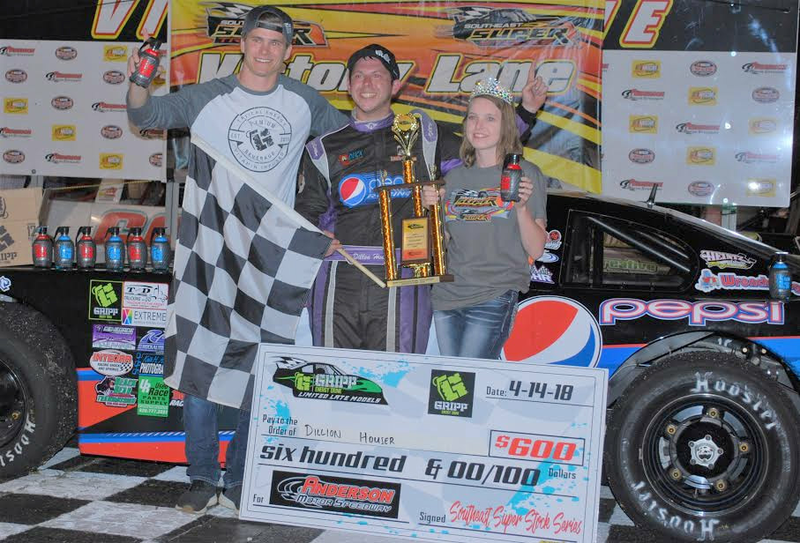 The Gripp Energy Limited Late Models kicked off their inaugural season this past Saturday night at Anderson Motor Speedway. The GELLM was formed this past winter after the Southeast Super Truck Series decided to phase away the Super Stocks. Which seemed to be the right decision as 18 of the best Limited Late Model drivers showed up in the Piedmont of South Carolina. The teams all unloaded their cars off the trailer and started getting them dialed in for the night’s festivities. Dillon Houser topped the first round of practice with his teammate Chris Phipps second fastest. During the second practice round it was Virginia’s Kyle Barnes who found his way to the top of the speed charts with Jonathan Flemming second fastest. During the final practice round it was up and coming star Tanner Brookshire that claimed the top spot. Qualifying was up next for the elite group of Stars. Dillon Houser from Hildebran, NC was the one who captured the Renegade Race Fuels & Oil Pole Award Position. Houser rolled a five on the invert dice, which now set John Gallman to lead the field down to the green flag for the race. Gallman followed the City Chevrolet pace truck around for the pace laps,and once it ducked off the track, he waited until the flag man gave him the okay. Gallman took off like a rocket, however before the field could complete a lap, the caution came out as four cars tangled on the track in turn three. Jonathan Flemming #6, German Holden #7, Randy Ollis #10 and John Mamph #65 all got together, Flemming and Holden were unable to continue ending their nights early. As Gallman paced the field back to the green flag, the caution came right back out for the second time as #3 Everett McMahan came to a stop on the back stretch. Gallman once again led them back to the green flag, with Kyle Barnes on his outside. The pair pulled away from the rest of the field, and raced each other as hard as they could. The third caution flew on lap 23 as #18 TJ Williams came to a stop on the front straight away. Gallman was on a mission as he took off again when the green flew, but this time he wasn’t able to hold off Barnes. Barnes was able to take over the top spot, but just for a couple laps before the caution flew again. The fourth caution shined as #14 Davey Smart came to a resting place on the back stretch. Barnes led the field back to the green flag, this time with Gallman on his outside. However bad luck struck Barnes as he had issues with his drive shaft ending his awesome run he had going. Gallman was back in the top seat, with Houser nipping at his heels. They raced each other hard lap after lap, until the fifth caution flew on lap 36. The #1 machine of Phil Peters went for a spin cycle in turn one. Gallman knew how to handle the pressure and he managed to hold off a strong restart from Houser, but before they could complete a full lap the caution flew again for the sixth time. The #18 of TJ Williams and #10 Randy Ollis collided in turn three. Gallman once again prepared himself for a hard charging Houser. Once again the caution flew, as the #10T machine of Marion Thomas and #17 of Baron Kuritzky got together on the back stretch, and ending both of their nights. Gallman once again got a excellent restart and held off Houser to keep the lead. They crossed the line with just ten laps remaining, Houser refused to let Gallman out of his sights. The caution flew one last time for the eighth time as #18 Williams and #14 tangled in turn three on lap 44. This setup for a six lap shootout, and that is exactly what it was. Gallman once again executed the restart and got inside the five to go mark. He held off Houser lap after lap, with just a couple laps left Houser used the bumper and gave Gallman a slight tap, and was able to make a move past him for the lead. Houser went on to capture the win (and also his first ever career win), followed by his teammate Chris Phipps in second, and Jesse Clark in third.